The Virginia basketball team meets Duke for the second time this season on Saturday. It’s a rematch of two top 5 teams that dueled into the final minute in Durham before the Blue Devils prevailed 72-70. That’s a great time for an “Ask The Sabre” segment presented by AskLandis.com. AskLandis.com is your full-service turn-key solution to help take back your home. From downsizing and decluttering to staging and moving and storage, they do it all. Why call five to 10 different companies when you can use just one? Give AskLandis.com a shot at your business. Here are a few questions and answers about the Hoos with Sabre Editor Kris Wright. Sabre Editor Kris Wright: So, unsurprisingly, Virginia fans are fired up about the rematch with Duke. The first round was a television blockbuster that went down to the wire with both coaches making in-game moves and counter-moves in real time. That sparks a lot of questions this time around, including some of the ones above. Will Duke switch all screens again? Will UVA spread the floor and drive after those switches? Does Coach K go back to the well with a few possessions of zone even though the Hoos go some wide open looks (and missed) in Durham? And so on. I can’t go through all the ‘what ifs’ for the rematch, but there are two things I’m interested in watching Saturday. First, if Duke does indeed switch all (or even most) screens the second time around, I think UVA might be able to create isolation opportunities for De’Andre Hunter that it likes to use anyway. That may not resemble the same spread-and-drive tactic that the Cavaliers used in round one, which they used often to attack Marques Bolden off the dribble. For starters, Bolden may not be out there as much with Jones back, and the Devils should be better prepared to try to contain dribble drive too. 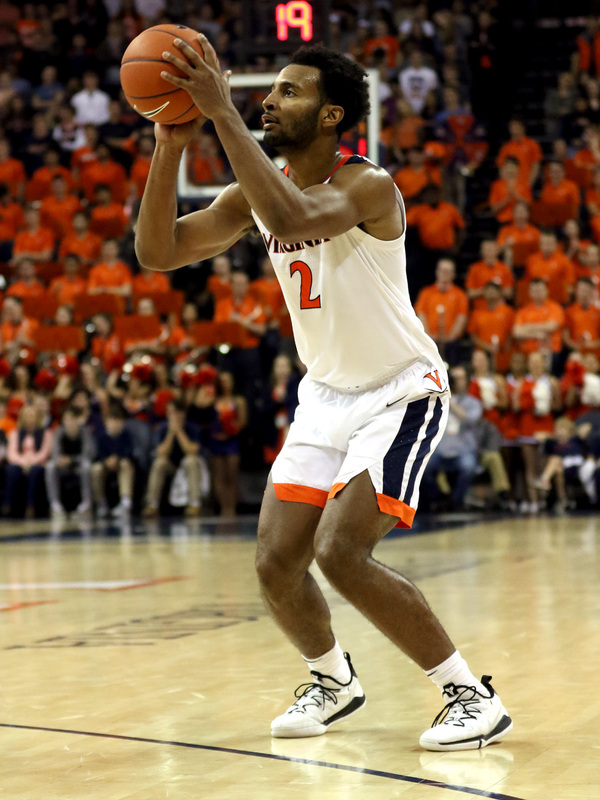 However, if the Hoos can run offense to create a switch and then put Hunter in those mid-range face-up spots that he likes to play through, that’s something that could get Hunter going and potentially collapse the defense a little bit to open up better 3-point looks than materialized in January’s meeting. Second, I’m interested in what approach UVA takes on defense this time. Like Duke, Virginia switched a lot of screens in that matchup and that left individuals in some unfavorable situations at times. There may not be a good individual matchup for Zion Williamson and he may get a bunch of points regardless so the Hoos may decide to keep the other matchups as solid as possible vs. switching to prevent certain actions from the Duke offense. Plus, the big key may be to try to contain the other piece of the dynamic duo, RJ Barrett. Hunter seems like a matchup that could cause some tough possessions for Barrett. Lastly, the Cavaliers’ biggest issue in game one was the inability to close off the gaps in drive defense so locking into standard Pack-Line Defense with minimal switching would allow players to focus on being in the right spots and perhaps shut off those lanes. Sabre Editor Kris Wright: Three words you don’t see together often – reasonable fan expectations! With three road games in the mix, 2-3 or better would be fair for expectations but 3-2 or better seems more likely assuming the full roster is available. The Cavaliers have played well on the road so that won’t be the same factor it is for some teams. All three Saturday games in this stretch have long prep/rest periods leading in as well and I think that should be helpful. Sabre Editor Kris Wright: I think it’s just familiarity with the system and new teammates. He’s closing in on 500 minutes played plus all the surrounding practice time. Plus, UVA’s coaching staff now has Cavalier game film to teach and work through. They’ve seen him play in 26 games so there’s a better understanding of which spots, lineups, and situations are best for him. I think the coaches’ ability to put guys in the best places and situations for success is an under-rated part of the consistency at Virginia. Don’t forget about the Mike Curtis effect either. Key transferred to UVA after the spring semester so he’s now eight months into his time with Curtis. I’ve noticed a more springy feel to his elevation over the last month or so as part of better conditioning overall. Sabre Editor Kris Wright: Two areas jump out the most to me with Clark. In terms of ballhandling, I think he needs to eliminate or reduce the jumping in the air and then deciding to pass. He gets stuck wanting to throw a wrap-around pass or a drop-off pass to posts but sometimes there’s not enough room to get those there at this level with the size of the athletes he’s going against. So he’s in the air with nowhere to go with the ball. Learning the Steve Nash keep the dribble alive technique on drives could help him there I think. Secondly, if he can improve his ability to finish at the rim or on drives, that will make him a tougher cover and a better passer/ballhandler overall. So far, we’ve seen him hit baseline floaters going to his left or getting to a right-handed layup by refusing ball screens, but not too much variety beyond that. Runners, floaters, and layups from different driving angles likely will be on his offseason menu like Jontel Evans and London Perrantes before him. Clark is currently shooting 42.3% on shots at the rim (which account for 31.7% of his total shots). Perrantes shot 35.5% at the rim (19.5% of his shots) as a freshman and improved that to 56.3% at the rim (20.1% of his shots) as a senior. Evans finished at 45.6% (64.8% of his shots) as a senior. Hoop-Math.com didn’t go back far enough to check Evans’ freshman numbers. Sabre Editor Kris Wright: It’s too early too worry about that. The roster will fill out as needed. If the Hoos have four viable big men, you could see a paired posts rotation like the days of Anthony Gill, Mike Tobey, Isaiah Wilkins, and Jack Salt. Will Tly Jerome be playing today? It sounds like he will play.